English Cream Golden Retriever Puppies Achievements is where Happy Families tell us about their Wisteria Goldens puppy’s Achievements (In-Training progress, awards, certifications, community service, or special achievements). To submit an update fill out the form here and then, we will add your puppy’s update to our website and to our Facebook Community Album. We need their Name (Mother/Father), picture, and a description. Also include any achievements, training program(s) progress, and/or certification title(s). We’d love to hear about any daily delights as well and will post those on the Happy Families page and on our Facebook Community. 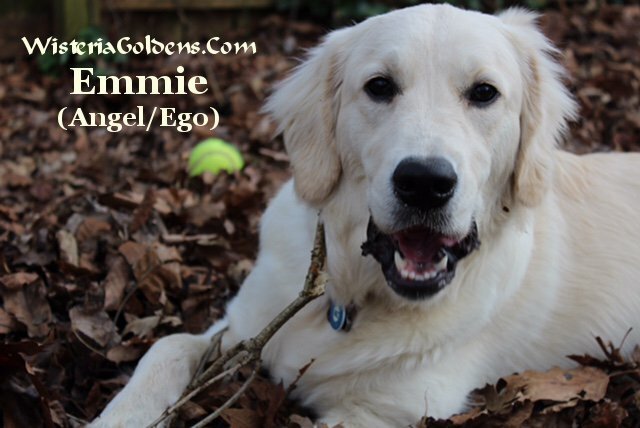 Our Emmie (Angel/Ego) is 8 months old already. She did great in beginner's obedience class and she is now attending a rally obedience class. She is full of energy and enjoys doggie school. We love our sweet girl! M.A. See more English Cream Golden Retriever Puppies Achievements here.